“What we’ve got here is a failure to communicate”. That is a reference to the 1967 movie Cool Hand Luke, and my assessment after rereading the findings of our Consumer Study on Customer Rage associated with complaints and the complaint handling process. The communication problem exists on many levels – between customers and company front line representatives for sure – but also between marketing and their customers, front line and back line operations, and due to inadequate communications and policy training within call center operations. Furthermore, consumers of all ages, especially older story-telling adults, have a hard time with clearly stating their problem and their expectation for a satisfactory resolution. As a customer experience expert, I have had the opportunity to listen to many thousands of consumer complaint calls over the years and can offer some advice for both companies and customers on how to better communicate and stop the rage. Companies have spent billions of dollars over the years adding staff, installing additional complaint handling channels and instituting extensive training, all in the effort to improve brand loyalty through improved complaint handling. But the recent Rage Study conducted by Dialog Direct, consulting firm CCMC and the Center for Services Leadership at W. P. Carey School of Business at ASU indicates these efforts are failing miserably. Only 14% of complaints are truly dealt with on the first call and most complaints require 4.2 contacts to resolve the issue. Further analysis may show that certain type of complaints, e.g. credit card disputes for example may have an even higher number of contacts to resolve. Dismal results, given that the contact center industry touts an average of 70% “First Contact Resolution” on all calls. Many companies are delusional – believing they are on track with customer satisfaction. But, as any experienced consultant can tell you – averages can lie. Companies need to analyze First Contact Resolution (FCR) at a call type level (e.g. complaints vs. order requests vs. info calls), in order to truly identify what issues need to be prioritized from a procedural and training perspective. or the company has prescriptive detailed complaint handling guidelines, often with suggested verbal scripts. In the former case, companies leave the customer complaint journey completely in the hands of newly trained employees or those who have not been schooled in customer experience theory and practice. Results depend on who the customer gets – which is never optimal. In the latter case, the complaint handling procedures or guidelines are often based on what the company believes the customer wants, and is with the approval of their legal department. These procedures are often based on little if any first person research as to what the customer really wants and that would significantly improve brand loyalty. That is the revelation of the Rage Study. It provides a data-driven prescriptive framework for a Complaint Handling and Service Recovery Program that actually improves individual brand loyalty and improves word of mouth advertising! 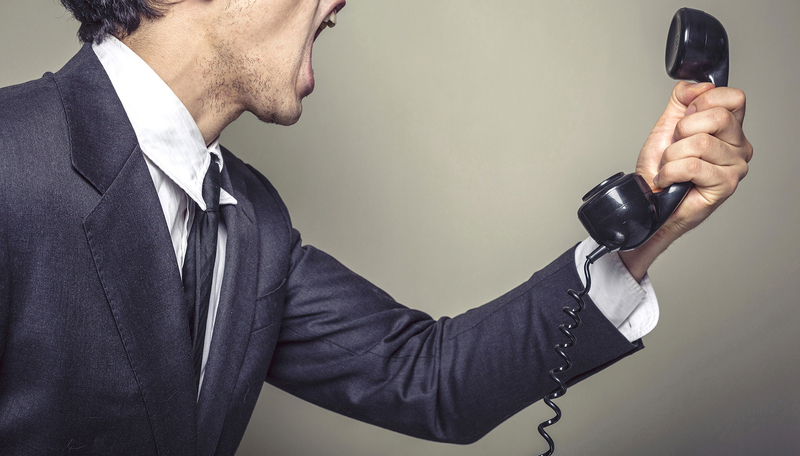 What can companies do to prevent customer rage? Get real and stop measuring averages– step one, understand your true FCR at the complaint level by measuring the number of contacts for complaint resolution. Step two, is to measure product type complaint resolution. You may find the root cause to the problems is at the marketing or operational level, and may have an opportunity to stop the complaint altogether – which is infinitely more critical and beneficial than improving the resolution process. Sincerely and personally apologize – 50% of executives confide to me that they do not allow their employees to apologize, as they are often prohibited to do so by their legal department. However, our Rage Study indicates that 75% of customers want an apology, but only 28% of customers say they receive an apology. Why is legal being so difficult? Because they believe by apologizing, the company is accepting liability. This is shortsighted thinking. In fact, studies show the opposite. Fewer legal actions are taken when an apology is offered, than when it is not. Additionally, it is entirely possible to deliver a “blameless apology”. Many companies have figured out how to do this. The key is a truly empathetic, not sympathetic employee who personally apologizes. But this must be carefully trained and practiced – it cannot be an “apology guideline” issued to the front line staff. Acquire and develop a common “answer database” – extracts of which are accessible by customers, front line and back line employees. Often we find that the front line employee properly handles the problem, however the back line employee either does not know the turnaround time quoted the customer, or does not understand current process or is not held accountable for the customer commitment. This database is a separate policy and procedure database and distinct from a case management system. It is not an “either or” scenario – you need both. Be careful in choosing your database – all databases are not created equal – we have found an amazing one which has its roots in university systems. With the database we instituted, we have found a FCR improvement of up to 10 points. Develop internal language guides – they are crucial, especially if you are in an industry with a lot of jargon, like healthcare or technical services. These guides help you eliminate industry jargon from the front line employees and the marketing departments, by giving them alternative language more easily understood by the customer (and the trainee for that matter). Listen – Really Listen – The number one item the customers say they want when complaining (93%) – is to be treated with dignity. However, only 37% of customers say they experienced this treatment. What do customers really want when they ask for dignity? For the most part, they want to be heard and treated as important to the company. Often, when listening to complaint calls, we hear the company representative “jump in”, interrupting the customer, because they have heard the complaint many times in the last week, and think they know what the complaint is, what caused it, and how to fix it. The representatives’ intentions are always good. They are trying to quickly solve the problem, saving the customer time in having to explain it, and the company money in terms of their productivity. But this good intention usually backfires. Big time. Companies need to reset expectations with their front line representatives, teaching them about what customers really want and translating that into actions that the representatives can take. In this case, letting the customer tell their full story in their own way and in their own time, without interrupting. Then the representative can paraphrase what they heard the customer declared was the problem, and most importantly, tell the customer in a firm and confident voice: “I can help you with that!” In all the calls we listen to, this latter phrase is the reset button with the customer, that makes them feel important and gives them confidence that their problem can and will be resolved. Use the Rage Study data – regarding what customers really want, to formally design a complaint handling and service recovery program. Remember to include both monetary and non-monetary items from the list of 12 attributes that customers want in the complaint process. Adding both non-monetary and monetary remediation improves the brand loyalty from 23-37% (either monetary or non-monetary) to 73%, when both methods are employed. Make it easy to complain – Eliminate tree prompts and create a team that can triage and handle complaints. Publish a separate 800 number. Don’t hide it deep down in the bowels of your website. Advertise that you want to hear the complaints. And then act on them. The current high level of rage among customers with complaint handling processes, may ultimately reduce the real number of complaints. If most customers feel they get “nothing as a result of complaining” (63% of complainants), they will stop complaining. That is the most dangerous scenario of all. Customers will just move to your competition instead, and speak negatively about your company to anyone willing to listen. Your company won’t know why the customer left and won’t have the opportunity to remediate the problem.